Background: Organotypic tissue-cultured skin equivalents are used for a broad range of applications either as possible substitute for animal tests or for transplantation in patient-centered care. Aims: In this study, we implemented melanocytes in a tissue-cultured full-thickness skin equivalent, consisting of epidermis and dermis. The versatility of this skin-like model with respect to pigmentation and morphological criteria was tested. Materials and Methods: Pigmented skin equivalents were morphologically characterized, and melanogenesis was evaluated after treatment with kojic acid – a tyrosinase inhibitor and forskolin – a well-known activator of the cyclic adenosine 3,5-monophosphate pathway. Pigmentation was measured either by determination of the extinction at 400 nm after melanin extraction with KOH correlated to a melanin standard curve or by reflectance colorimetric analysis, monitoring reflectance of 660 nm and 880 nm emitting diodes. 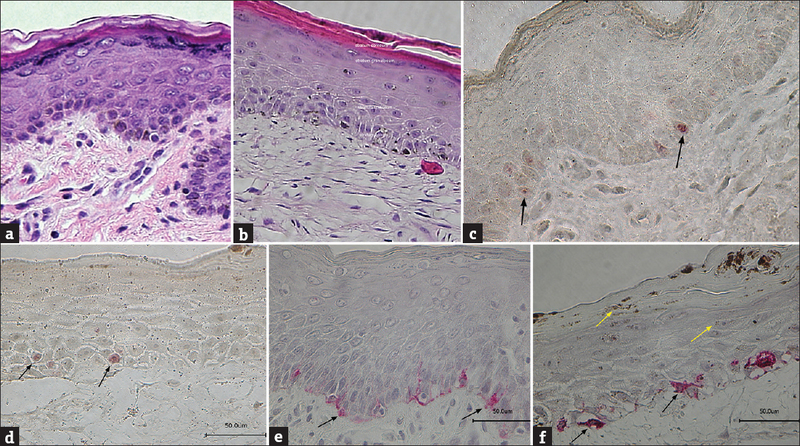 Results: The morphological analysis revealed characteristic epidermal stratification with melanocytes located at the basal layer. Stimulation with forskolin increased the pigmentation, whereas treatment with kojic acid caused bleaching. Conclusion: The present study demonstrates that the herein-introduced organotypic tissue-cultured skin equivalent is comparable to the normal human skin and its versatility in tests regarding skin pigmentation. Therefore, this model might help understand diseases with dysfunctional pigmentation such as melasma, vitiligo, and postinflammatory hyperpigmentation. Background: Nowadays noninvasive techniques are performed to evaluate the biophysical properties of skin in vivo. Aims: The aim of this study was to evaluate the biophysical and ultrasonographic properties of skin in chronic contact or atopic dermatitis to provide better insight into pathogenesis, diagnosis, and treatment response. Materials and Methods: The stratum corneum hydration, transepidermal water loss (TEWL), pH, erythema, melanin, sebum, friction, temperature, elasticity parameters (R0, R2, and R5), the thickness and echo-density of epidermis, dermis, and subepidermal low-echogenic band (SLEB) were measured on lesional, perilesional, and symmetrical skin of 22 chronic dermatitis patients. The average of perilesional and symmetrical skin values (control) was compared with lesional values. Results: Stratum corneum hydration (P<0.001), friction (P=0.02), sebum (P=0.01), and R0 (P<0.001) were significantly lower in lesion, TEWL (P=0.03), pH (P=0.001), erythema (P=0.004), and temperature (P=0.04) were significantly higher in lesion. The thickness of epidermis (P=0.002), dermis (P=0.034), and SLEB (P<0.001) were significantly higher in lesion; and the echo-density of dermis (P<0.001) and SLEB (P<0.001) was significantly lower in lesion. Conclusion: Chronic contact and atopic dermatitis are characterized by certain changes in biophysical and biomechanical properties of the skin. The evaluation of these parameters might be useful in the early diagnosis and assessment of treatment response. Background: Vitiligo is one of the common depigmenting disorders causing disfigurement and affecting the quality of life. Redox imbalance is known to play a contributory role in melanocyte destruction. Serum sialic acid (SA) is an important marker of the acute-phase response and is associated with oxidative protein damage. 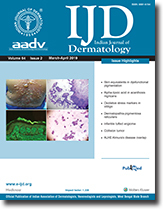 Aim: The aim of this study was to analyze the status of oxidative stress markers and serum SA in vitiligo patients and to correlate the same with disease activity. Materials and Methods: The different oxidative stress parameters namely superoxide dismutase (SOD), malondialdehyde (MDA), and serum SA were measured spectrophotometrically using standard biochemical methodologies in all the study subjects. 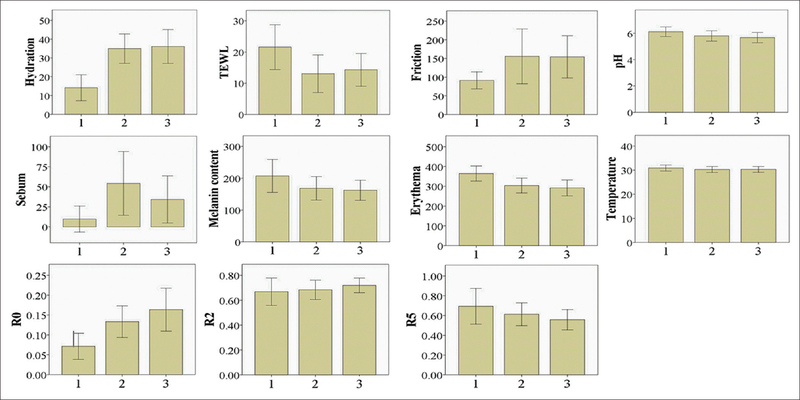 Results: Serum SOD and MDA values were higher in patients with active vitiligo (n = 23) as compared to stable vitiligo (n = 20) and healthy controls (n = 20). The MDA/SOD ratio was higher in patients with active vitiligo (P<0.0001). Serum SA was increased in active vitiligo as compared to stable vitiligo and healthy controls (P<0.0001). Conclusion: This study indicates that patients with active vitiligo demonstrate enhanced MDA/SOD ratio and increased serum SA. The studied parameters can serve as an important tool to monitor disease activity in vitiligo. Context: Autoimmune blistering diseases (AIBDs) are characterized by autoantibodies directed against antigens of skin. Direct immunofluorescence (DIF) study helps in confirming the diagnosis where histopathology alone is noncontributory. Aims: This study aimed to evaluate the clinicopathological and DIF features of intraepidermal AIBD and to assess their relative diagnostic significance. Materials and Methods: It was an institution-based observational study. A total of 34 patients were studied over a period of 1½ years in the Department of Pathology in collaboration with the Department of Dermatology of a tertiary care hospital. The clinical, pathological, and DIF features were evaluated and documented. Statistical Analysis: Data were analyzed by statistical tests using GraphPad InStat. Results: Pemphigus vulgaris (PV) was the predominant type with 18 (53%) cases followed by 15 (44%) cases of pemphigus foliaceus (PF) and a single case of pemphigus erythematosus (PE). The age of the patients ranged from 17 to 85 years. Overall, there was a female preponderance in the study group. The most common presenting feature was pruritus (58.82%). 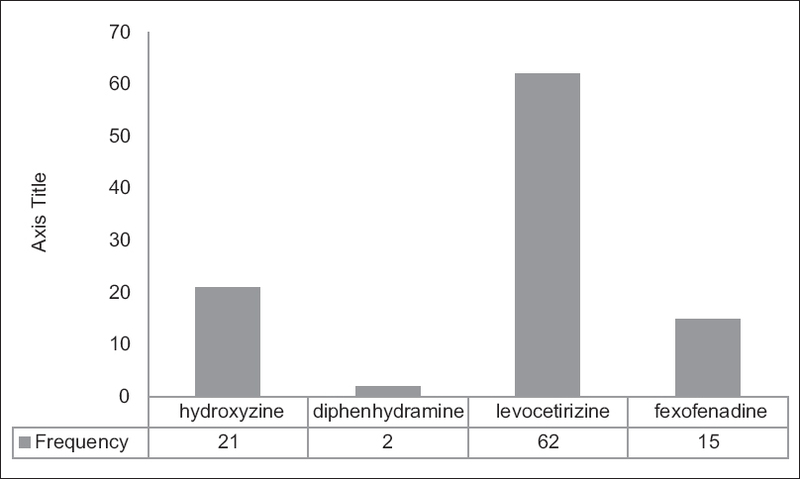 Tzanck smear showed the presence of acantholytic cells in thirty (88.24%) patients. Characteristic histopathological features were present in all the cases of PV and PF except one case of PF which was found to be a case of PE. DIF study showed intraepidermal deposition of intercellular immunoglobulin G (IgG) and C3 both in PV and PF. The case of PE showed epidermal “antinuclear antibody” staining with IgG. Conclusion: Immunofluorescence study may be used as an additional tool for confirmation of diagnosis where histopathology alone is inconclusive. Background: With the declared elimination of leprosy as a public health problem, the World Health Organization has shifted the focus on the disabilities and deformities associated with leprosy. Aims: The aim was to study the Grade 1 and Grade 2 disability among newly diagnosed leprosy patients. Materials and Methods: All newly diagnosed leprosy patients attending the Outpatient Department of Government Medical College, Kozhikode, from January 1, 2013 to December 31, 2013 were included in the study and the Grade 1 and Grade 2 disabilities observed were analyzed. Results: During the 1-year period, 76 patients were diagnosed to have leprosy. Grade 1 and Grade 2 disabilities were noted in 31.6% and 17.1%, respectively. Major factors identified as risk for leprosy disability at the time of diagnosis were age >45 years, >5 skin lesions, ≥2 thickened peripheral nerve trunks, pure neuritic and borderline tuberculoid spectra of leprosy. Limitation: As the study was conducted in a tertiary care center, it does not perfectly indicate the status in the community. Conclusion: Disability noted in nearly 50% of leprosy cases at the time of diagnosis highlights the need to improve the effectivity of existing health-care system in early case detection and timely referral. In addition, it underscores the need to educate the affected regarding protective eye, foot, and hand care, so that progression to Grade 2 disability can be prevented. Background: Antihistamines are one of the commonly prescribed groups of drugs for allergic disorders and pruritus. They are broadly grouped into two generations, the second-generation ones being more effective and with less side effects. The family physicians frequently use antihistamines as patients contact them initially for their problem. It will be interesting to know the mode of selection of antihistamines by them. Materials and Methods: The study was carried out on a sample of 100 family physicians. Primary data were collected from them after taking informed consent. A pre-validated questionnaire regarding knowledge, awareness, and prescribing schedule of antihistamines was filled up. The data were then analyzed with suitable statistical tests. Results: Almost 73% of physicians prescribed second-generation antihistamines, while 27% prescribed the first-generation ones. Only 15% of them were aware about the ARIA and GA2LEN guidelines and their recommendations for prescribing second-generation antihistamines over the older first-generation antihistamines, while 85% had not heard about them previously. A minimum 7% of practitioners revealed that they updosed the same drug four times in the treatment of urticaria, while 93% did not do it. Conclusion: Even though a sizeable percentage of family physicians prescribed second-generation antihistamines, most of them were not aware of their dosing guidelines. 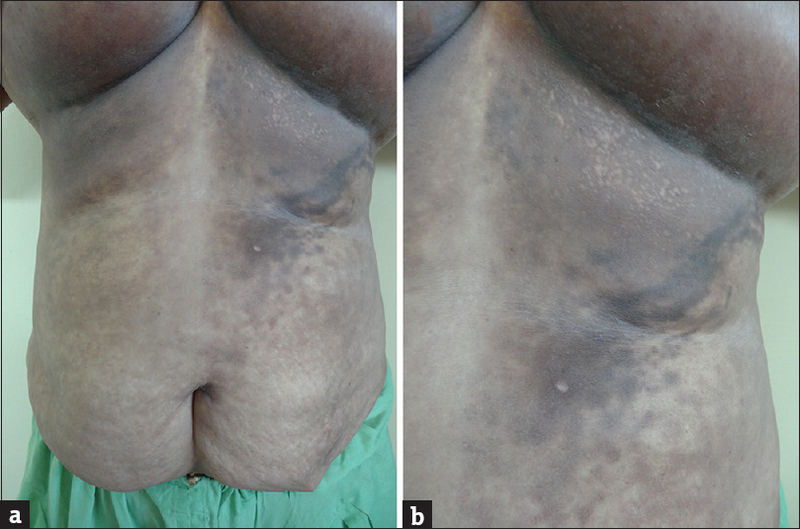 Background: Acanthosis nigricans has been associated with conditions of insulin resistance such as obesity, polycystic ovary syndrome, and type 2 diabetes. Metformin and alpha-lipoic acid, two types of insulin-sensitizing agents, have been demonstrated to reduce insulin levels and improve insulin sensitivity. Alpha-lipoic acid is available as a fixed-dose combination with biotin, calcium pantothenate, and zinc sulfate as Canthex™. Aims: This study aimed to compare the effectiveness, safety, and improvement of the insulin resistance profile of Canthex™ and metformin in acanthosis nigricans. 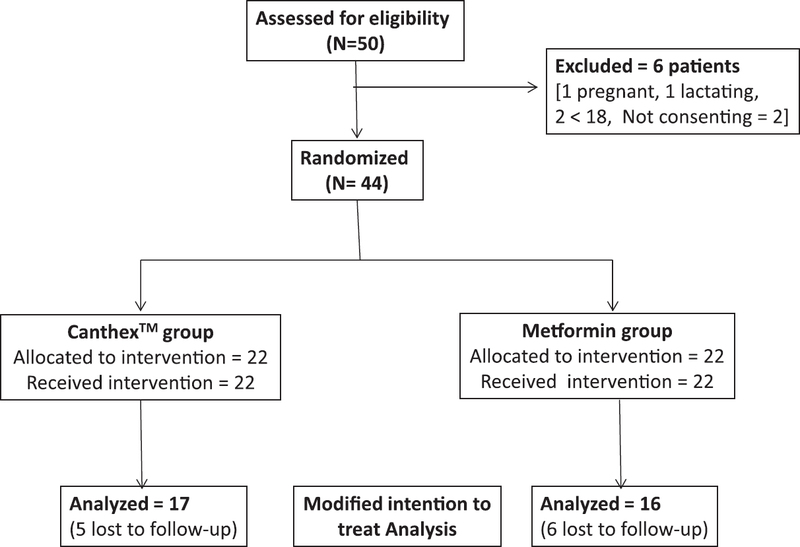 Materials and Methods: In this double-blind, randomized (1:1), active-controlled trial (CTRI/2017/02/007880), participants received either metformin 500 mg BD or Canthex™ BD for 12 weeks. Effectiveness parameters were improvement of severity of neck lesions and neck texture. Serum fasting insulin level, glucose, lipids, body weight, waist circumference, body mass index (BMI), and homeostatic model assessment-insulin resistance (HOMA-IR) were also assessed at baseline and at the end of the study. Adverse effects and changes in routine laboratory parameters were taken as safety parameters. Results: Thirty-three patients were analyzed by modified-intention-to-treat criteria. 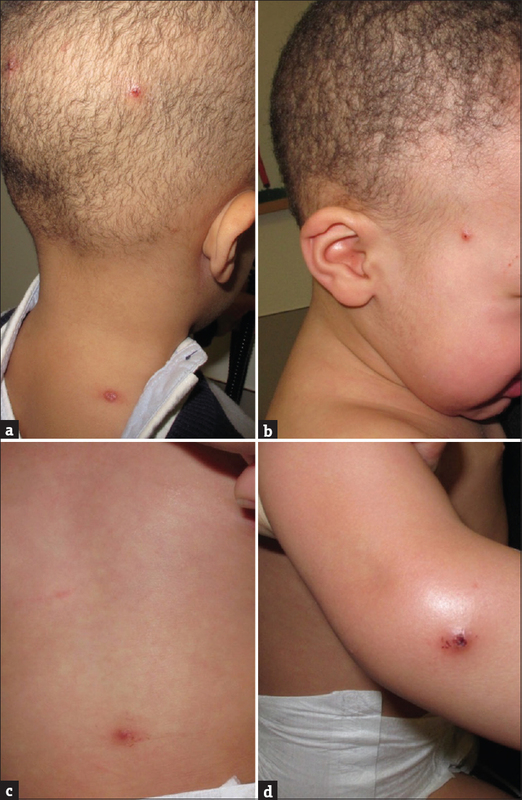 Severity of neck lesions and texture were comparable at baseline and it showed significant reduction (P<0.001) in both the treatment arms from the first follow-up onward. No intergroup variation was observed in any of the follow-ups. There was reduction in the values of fasting insulin, blood sugar, total cholesterol, and thyroid-stimulating hormone in both the groups. Weight, BMI, and waist circumference and BMI reduced significantly in both the groups. HOMA-IR decreased significantly in metformin group (P<0.001). 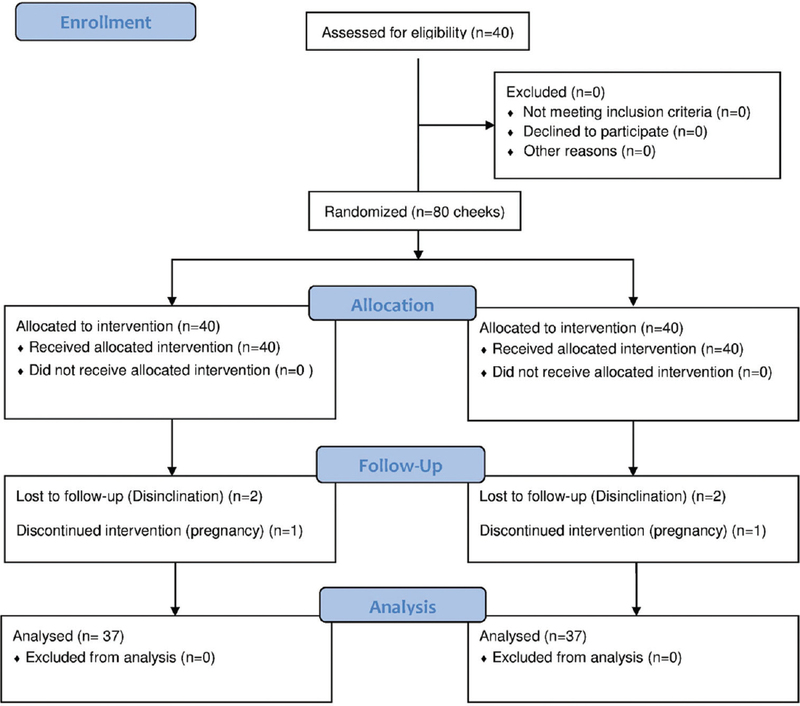 Conclusion: Canthex™ is as effective and safe as metformin in the management of acanthosis nigricans and associated features of insulin resistance. Background: With the introduction of newer anti-cancer agents, the adverse effects have become more rampant which call for concern in the treatment of patients with cancer. Hence, the assessment and management of dermatological adverse effects of anti-cancer therapy have become a significant part of the care of patients with cancer and require proper and close collaboration between the dermatologists and the oncologists. Aims: To assess the frequency and pattern of mucocutaneous adverse reactions to cancer chemotherapy and chemoradiation and grade them according to their severity and to identify hematological and biochemical changes related to cancer chemotherapy-induced mucocutaneous adverse reactions. Materials and Methods: This was a descriptive study done among 226 patients in an Indian tertiary care hospital, who presented with mucocutaneous adverse reactions to either chemotherapy alone or combination of chemotherapy and radiation to dermatology, medical oncology and radiotherapy outpatient departments. Detailed history and examination were undertaken. Visual analog score (VAS) was employed to quantify pain and pruritus. Correlation of various biochemical and hematological parameters with chemotherapy-induced adverse reactions was attempted and grading of adverse reactions was done based on the severity scale of Common Terminology Criteria for Adverse Events (CTCAE). Results: The common cutaneous adverse reactions observed in our study were nail changes (194 patients; 85.84%), followed by skin changes (191; 84.51%), hair changes (159, 70.35%), mucosal changes (34, 15.04%), and other miscellaneous manifestations. Grade 1 manifestations comprised of 49.91% of total manifestations followed by Grade 2 (45.45%) and Grade 3 (5.64%). In addition to bleomycin, other chemotherapeutic agents also had been shown to produce flagellate dermatitis in our study. 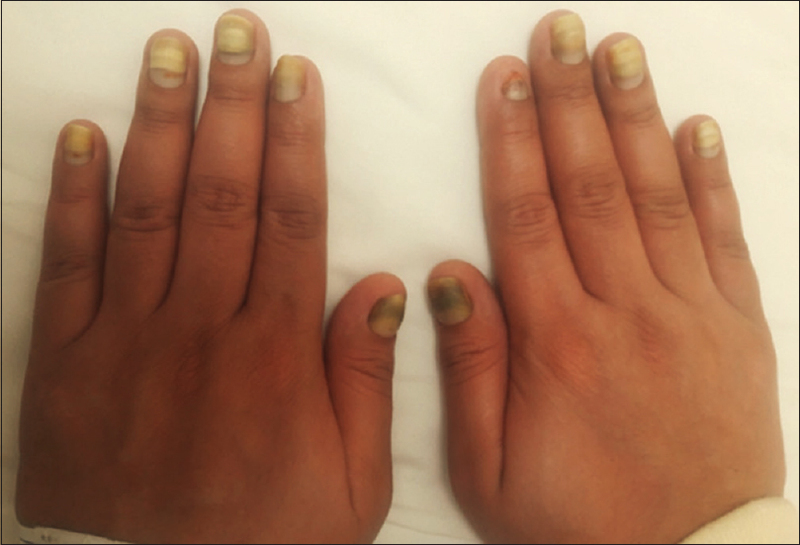 Conclusion: Nail changes, skin changes, hair changes and mucosal changes occurred frequently as a significant side effect of chemotherapy, which a physician should be aware of, while selecting a chemotherapeutic drug. Background: Melasma is a chronic hyperpigmentation skin disorder mainly affecting women in the reproductive age. Available treatments for melasma do not lead to long-term satisfactory results. Aims: This study aimed to compare the efficacy of fractional CO2 laser in combination with topical therapy to topical therapy alone. 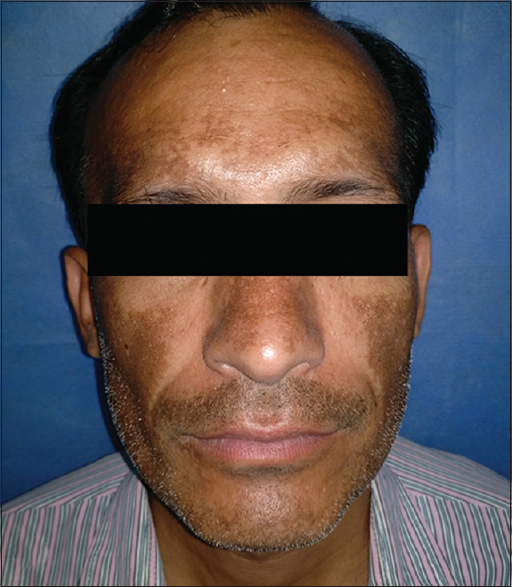 Materials and Methods: Forty women with bilateral melasma were studied in this randomized single-blinded clinical trial. Each side of the face was randomly allotted to either topical hydroquinone 4% or combination of topical hydroquinone 4% and fractional CO2 laser. Patients received three sessions of laser therapy at 3-week intervals. Hydroquinone 4% application on both sides maintained for 3 months after the last laser session. The clinical improvement (darkness [D] and homogeneity [H] of hyperpigmentation) was measured by a blinded main investigator and an outcome assessor. Furthermore, improvement was assessed by physician's global assessment (PGA) and patient satisfaction (visual analog scale [VAS] score). Results: Significant reduction in D observed 3 weeks after combination therapy (P<0.001) and 6 weeks after monotherapy (P<0.001). Reduction in H became significant after 6 weeks in both groups (P<0.001). However, the two methods were not considerably different in any session (P>0.05). Furthermore, control and experiment sides were not significantly different considering VAS score and PGA (P>0.05). Conclusion: Considering the short-term outcome of laser and hydroquinone therapy, we can apply it to obtain earlier positive results. However, because of the lack of significant difference between the two methods and also the high cost of laser therapy, it seems better not to recommend fractional CO2 laser to patients as adjunctive therapy for long-term treatment of melasma. Hereditary ectodermal dysplasias, a group of disorders affecting skin, hair, nails, and teeth, consist of two main clinical forms – hypohidrotic and hidrotic. Clouston syndrome is a hidrotic ectodermal dysplasia characterized by a triad of generalized hypotrichosis, palmoplantar hyperkeratosis, and nail dystrophy. This paper reports a large Indian family with Clouston syndrome but with the absence of palmoplantar keratoderma, one of the features of the typical triad, thus representing phenotypic heterogeneity, in spite of the presence of a common known mutation in GJB6 gene (p.Gly11Arg). Tufted angioma (TA) is a rare benign vascular tumor that may be congenital or acquired and generally presents as an asymptomatic or painful solitary erythematous to violaceous poorly defined plaque. Hyperhidrosis and hypertrichosis may be associated. The lesions have tendency to resolve spontaneously, in majority, within 2 years of disease onset. However, occurrence of Kassbach-Merritt phenomenon should be looked for. We present a case of 8-months-old infant with TA over the right forearm with classical clinical, histoptahological and immunohistochemistry features. Dermatopathia pigmentosa reticularis is a rare ectodermal dysplasia that presents with a triad of reticulate hyperpigmentation, nonscarring alopecia, and nail dystrophy. 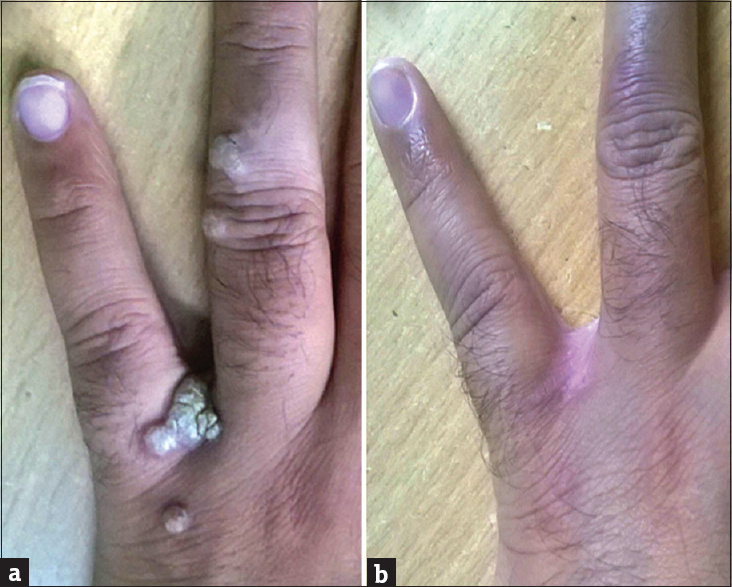 We report herein a case of a 23-year-old male presenting with the characteristic triad associated with anhidrosis and palmoplantar keratoderma. Lichen planus pigmentosus (LPP) is a rare disorder affecting primarily the people with ethnic skin. It results in hyperpigmentation of sun-exposed sites along with the involvement of flexures. In accordance with clinical patterns, different variants such as diffuse, blotchy, reticulate, and perifollicular have been described. Rare variants such as flexural (inversus), mucosal, linear, and zosteriform have been reported scarcely. Inversus LPP refers to the involvement of major flexures such as inframammary area, axillae, and groins in the absence of involvement of photo-exposed sites. We present an unusual case presenting with coexisting linear and inversus variants of LPP. Coexistence of two types of malignant neoplasms, called 'a collision tumor,' is relatively uncommon. Basal cell carcinomas (BCCs) are known to coexist with other cutaneous lesions, but the collision of BCC with malignant melanoma is rare. 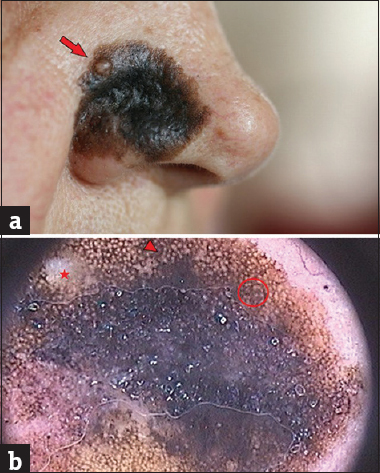 We report a rare case of BCC with underlying lentigo maligna melanoma, focusing on dermoscopic and reflectance confocal microscopic (RCM) findings and their correlation with histopathology. RCM and dermoscopy seem to offer important clues to increase clinical suspicion of collision tumors and improve clinical diagnosis. Background: Studies have been done on acetylation phenotype in different diseases but not with allergic contact dermatitis (ACD). Patients and Methods: Thirty-five ACD patients and 67 healthy volunteers were enrolled in the study. After an overnight fast, each participant received a single oral dose of 100 mg of dapsone. Three hours later, a blood sample was taken from each participant and plasma was separated to determine dapsone and its metabolite (monoacetyldapsone) using high-performance liquid chromatography. Results: Nearly 60% of the patients (21 out of 35 ACD patients) were slow acetylators compared with 72% (48 out of 67 controls), and a statistically significant difference was found. No association between the acetylator status and personal/family history of allergy, patch test positivity, and even the sites of ACD was detected. In the ACD patients with slow acetylators, the lesions of dermatitis presented mainly on the face, neck, and upper limbs, while those with rapid acetylator have predominant lesions in the chest, oral region, and axillae. Conclusion: A rapid acetylator status might predispose to ACD without influencing other features of this disease. Background: There is an increased incidence of allergic contact dermatitis (ACD) over the lower extremities due to over-the-counter topical preparations, occupational risk, and usage of several chemicals in the manufacture of designer footwear. Aims and Objectives: The aim of the study was to identify the common allergens and polysensitization pattern involved in ACD over the lower extremities. Materials and Methods: It is a cross-sectional study, wherein a total of 80 patients were recruited over a period of 18 months. Demographic and clinical characteristics were noted. Patch test was done with the Indian standard series. 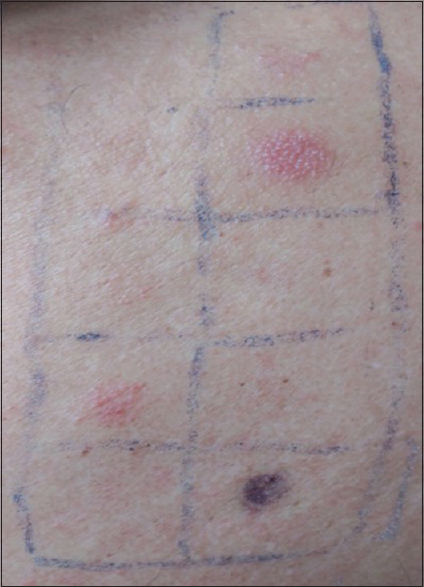 Interpretation of patch test readings was read according to the International Contact Dermatitis Research Group criteria at 48 and 96 h. Results: There were 45 males and 35 females (M:F= 1.3:1). Mean age was 41.65 years. Most of the patients belonged to 21–40 years age group. Farmers, homemakers, and students were commonly affected. Most common presentation was itching, hyperpigmentation, and scaly plaques over the feet. Patch test was performed in 75% of the patients. One or more positive results were observed in 57% of the patients. Common allergens noted were potassium dichromate (35%), followed by nickel sulfate (23.5%), mercapto mix, and mercaptobenzothiazole. Potassium dichromate and nickel were the common allergens reported in males and females, respectively. Neomycin was the common medication responsible for dermatitis medicamentosa. Polysensitization was seen with mercapto mix, mercaptobenzothiazole, potassium dichromate, and fragrance mix. Conclusion: Potassium dichromate and nickel were the common allergens responsible for ACD over the lower extremities. Polysensitization was seen commonly with mercapto mix, mercaptobenzothiazole, and fragrance mix. Recommendation: Screening for usage of topical preparations and late patch test readings (96 h or more) is recommended. 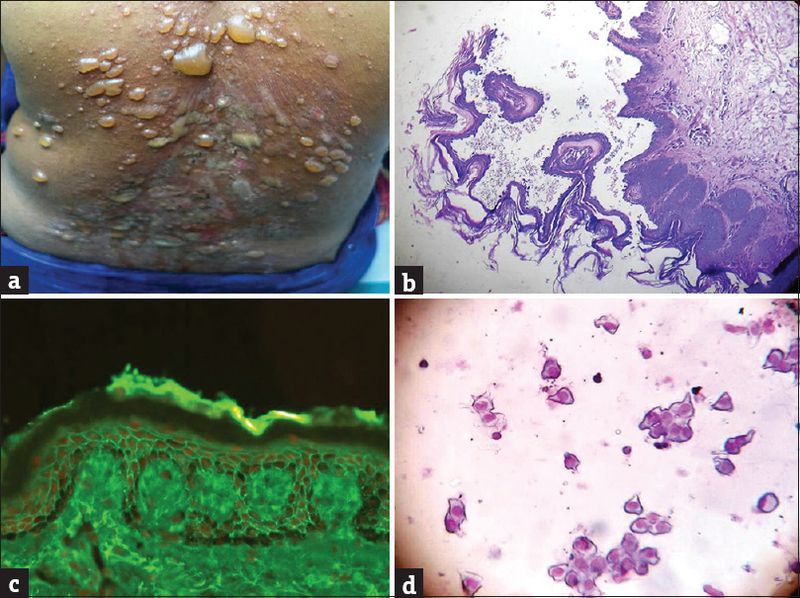 Background: Cutaneous warts present a therapeutic challenge because of recurrence and multiplicity and may become a frustrating condition for both patients and physicians. In the past few years, there has been an increase in intralesional immunotherapy for recurrent multiple warts not only because of its encouraging results in the treatment but also due to its ability to clear distant warts and preventing recurrence. Objective: The objective of this study was to evaluate the efficacy and safety of intralesional bacillus Calmette–Guerin (BCG) vaccine immunotherapy in the treatment of recurrent multiple warts. Materials and Methods: This study included 40 adult patients with multiple recurrent extragenital warts of different sizes, numbers, and duration, with or without distant warts. Patients were injected intralesionally with 0.1 ml BCG vaccine into the largest wart at a 3-week interval, directly without a pre-sensitization skin test, until complete clearance or for a maximum of three sessions. Follow-up was done every month for 3 months to detect any recurrence. Results: Out of the 40 patients enrolled in the study, 34 patients completed the treatment protocol of three injections and 3 months of follow-up and six patients discontinued for various reasons. Complete clearance of the lesions was achieved in 25 (73.53%) patients, partial clearance in 8 (23.53%) patients, and no response in 1 (2.94%) patient. Complete response was demonstrated in 75% of those presenting with distant warts. Therapy-related side effects were mild in the form of pain during injection, itching, erythema at the site of injection, and flu-like symptoms. None of the patients with complete response showed recurrence of lesions in a 3-month follow-up period. Conclusion: Intralesional BCG immunotherapy is a safe, effective, and promising treatment modality for recurrent multiple warts. Two adult patients from a village of district Bhilwara, Rajasthan, consulted Skin Department of R. N. T. Medical College and Hospital, Udaipur, with complaints of thickening of the palms and soles and pigmentation of skin with a nonhealing ulcer on the palm. They also had complaints of loss of appetite, abdominal pain, nausea, vomiting, and loose motion. On examination, there were multiple 2–3 mm, keratotic papules on the palms, and soles on the background of diffuse keratoderma. Two irregular nonhealing ulcers were present on the hands which on excisional biopsy revealed squamous cell carcinoma. 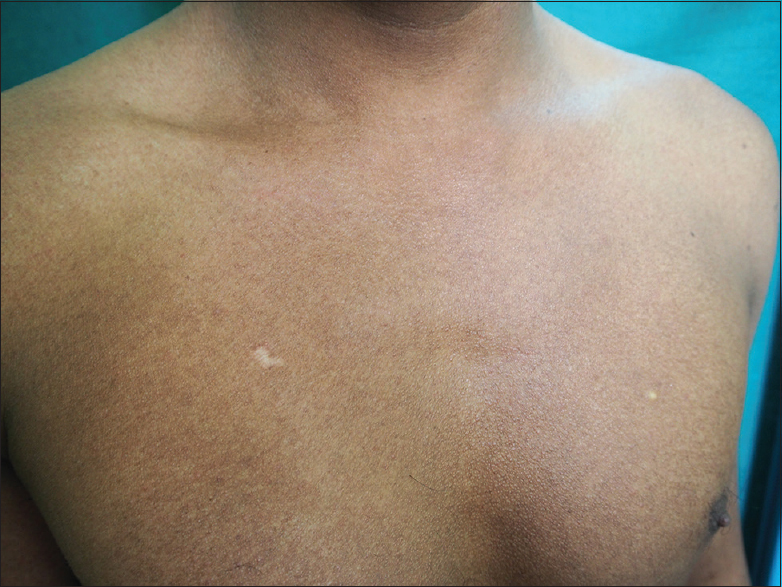 A generalized mottled pigmentation was present over the trunk and proximal parts of extremities. 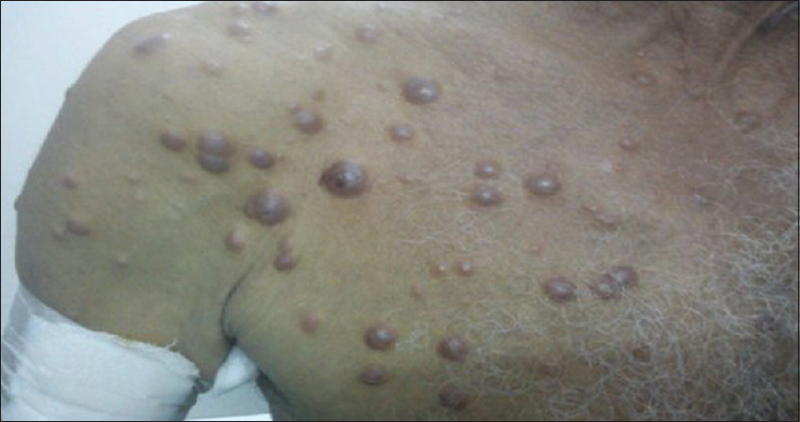 The clinical presentation was suggestive of arsenicosis. There was history of similar ailment in some of the fellow villagers as well. With the help of health authorities, a survey was conducted in the village and it was found that eight more villagers were suffering from similar kind of illness. The common source of arsenic was explored and found to be increased in drinking water that was taken out through hand pump. The level of arsenic in drinking water was significantly above the WHO safe limit for arsenic.